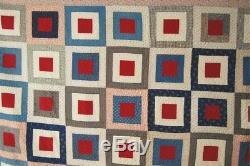 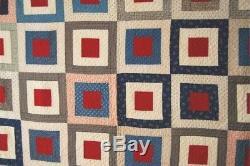 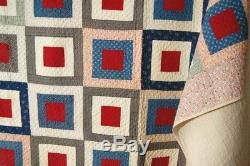 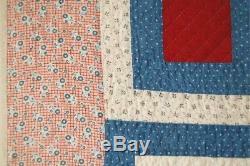 COLORFUL Vintage 1900's Framed Squares Antique Quilt Bold Op Art Design! 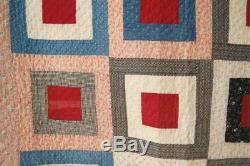 This GORGEOUS cotton 1900's (some of the fabrics date back to the late 19th century) framed squares quilt is hand pieced and hand quilted, with wonderful solid maroon centers. 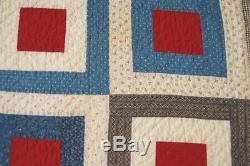 It measures 80" X 80" and is in excellent condition, with a couple of small, faint spots and no wear. 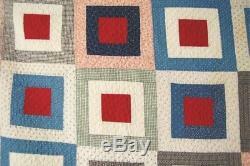 The quilt feels strong and sturdy overall. 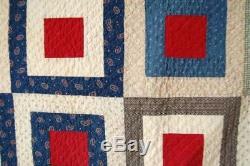 The quilting is wonderful, with close straight line quilting throughout at an even 9-10 stitches to the inch. 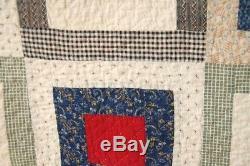 The back and hand stitched, rolled binding are white, and the batting is thin. 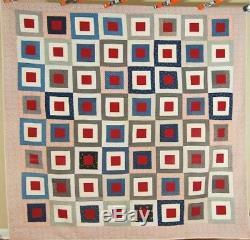 The ELEGANT COLORS, GREAT DESIGN, and LUSH QUILTING make this turn of the century COLLECTOR'S QUILT stand out! 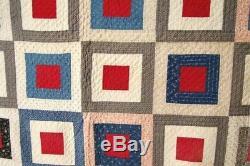 The item "COLORFUL Vintage 1900's Framed Squares Antique Quilt Bold Op Art Design" is in sale since Thursday, November 30, 2017.